The aim of an innovative management is to intentionally create a “chaos edge” and to foster and organize the ideas which are born. Chaos edge is a term usually used in complexity studies, but it is also highly applicable to management. In this paper, the management concept used to create innovation is referred to as “Holonic management.” Holonic management requires the following three elements: 1) cultivating the soil from which innovation shoots can grow, 2) introducing an appropriate competition principle, and 3) preparing a strict evaluation and proper support system. Constructing the field of chaos edge in holonic management can activate an internal environment to create ideas, which result in the internal cooperative work possible to generate innovation. The “Heretic management” finds the innovation shoot created by a minor group within a corporation and allows it to grow without fear of failure. This is not just the most effective tool. It is also the method for the realization of knowledge management. Corporate strategy should direct the way we invest managerial resources such as people, capital and materials in order to achieve corporate intention. Historically speaking, strategy has been used within military terminology, exemplified by the ancient Sun Tzu’s ‘The Art of War’ or in more recent history, Carl von Clausewitz’s ‘On War’. Strategy has been argued for over 2300 years, since Sun Tzu or more recently in the 200 years since von Clausewitz (1780–1831) that it continues to be a permanently ongoing subject of interest. What is the essence of corporate strategy? If it is true, what is required within the corporate world in order to continue its progress by contributing to society, strategy is nothing but a methodology to achieve the requirements. Therefore, it is not until the ‘action’ to conduct the strategy and to obtain the ‘results’ that we realize the true value of strategy. It is worthless to argue a strategy merely on ‘desk principles’. An ancient precept teaches the importance of ‘unified knowledge and action’ that is the thought offered by Wang Yangming (1472–1529), who was the founder of Yangming school and known as an activist among Confucian scholars. This precept means that ‘knowledge’ and ‘action’ are undividable and ‘action without knowledge’ or ‘knowledge without action’ loses the truth. Once the precept is applied to strategic management, strategy cannot be considered not worthy until it has been conducted and achieved actually, and simultaneously corporate can only manage coherently with its vision and policy, if the corporate has employed individual management tactics. The current world climate is shifting towards a ‘knowledge society’. John Naisbitt in ‘Megatrends’ (1982) forecast the ‘Ten Tidal Waves’ toward the 21st century, in which he said the temporal industrial society would move towards an information society. In such an information society, networks would become more important than social hierarchy, and a smaller organization or individual human capability would be more significant than larger ones. This trend suggests that corporate competitiveness supporting economic growth is achieved by ‘virtual resources’ such as individual knowledge and wisdom rather than real financial capital such as plant or land (Naisbitt, 1982). An ‘innovation’ is realized by human knowledge and wisdom and becomes the organizational tool used to pursue corporate strategy with actual behaviors. During the last ten years of the 20th century, we witnessed the transformation of an industrial society towards a knowledge-based society. For instance, even though the real property of Microsoft was only one twentieth of the size of General Motors, Microsoft’s stock price attained a total three times that of GM. There are many large companies that leverage their real properties to progress more towards the knowledge -based market, and it is probable that these results accrue from excellent management such as the ‘perpetual innovation’ that brought about Microsoft’s prosperity (Gates, 1996). In a knowledge-based society, the most important managerial resource is people. In an industrial society, resources; people, capital, materials, and information were valued in equal measure. However, the wisdom of utilizing corporate resources was generated by people. This meant that people became the first prioritized resource in the knowledge-based society. 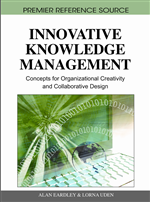 What kind of corporate management is required for the new knowledge-based society? In Naisbitt’s view (1982), the aim of management in a knowledge-based society is to maximize the capabilities of the small organization and the individual person. In other words, management’s target is to utilize the network rather than the hierarchy which was previously a major factor in a conventional management style. We call this new management style ‘innovative management’. Innovative management does not premise the conventional hierarchical type of management model but uses a ‘holonic’ type, whereby a large-scale empowerment of individual employees is secured in order to respect his or her autonomy and to stimulate his or her originality, which differs from the conventional model of employee governing style as shown in Figure 1.